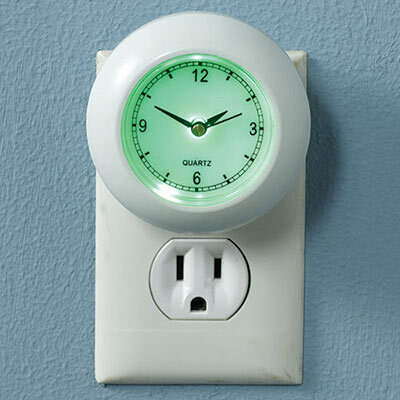 This Clock Nightlight does double duty. Provides a nighttime glow in the kitchen, bath or bedroom. Plus the back lit face lets you see the time easily. Compact size in durable plastic with reliable quartz movement. Uses 1 button cell battery (included). 3" dia. Very bright green light to see time in the dark. This little clock is such a convenient item. It runs on two watch batteries and actually quietly ticks. I found this out one night I was having trouble sleeping. 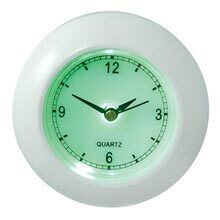 When the clock is not plugged in it still operates - because of the batteries - but it doesn't light up. When plugged in it is illuminated. Very convenient. Love it. Provides plenty of light at night and is so convenient for knowing the current time. I have been searching for this type of item for a long time. I ordered a second one in case I don't see it again. I am very happy with my purchase!